Resulting from a unique synergy between the innovative CLEAN'OYA® Lite technology, mineral clay and aloe vera, My Purifying Mask « Sweetness & Radiance » reveals the glow of the dullest complexions and offers the skin freshness and vitality. EARN 110 POINTS BY PURCHASING THIS PRODUCT! Formulated to respect each type of skin, My Purifying Mask « Softness & Radiance » is an ideal pore-purifying care to revive the natural glow of the skin. Its unique composition enriched with white mineral clay, aloe vera and shea butter gives the skin an unparalleled sensation of comfort for a visible result and softens skin. Mineral clays, key components of this mask, are known to deeply purify the skin and absorb excess sebum where the skin needs it. The combination of aloe vera and shea butter offers unparalleled hydration, for a purifying care that does not dry the skin. The CLEAN'OYA® Lite technology, specially developed to be suitable for sensitive skin, offers deep cleansing for visibly tightened pores. This treatment specifically developed for black, matte and mixed skin combines perfectly with CLEAN’OYA® EXTRA My Gel « Cleansing Exfoliating » and will be your beauty ally to find a clear skin, smooth and radiant health. Based on a new technology "CLEAN'OYA® Lite", formulated without silicone and 95% natural ingredients, My Purifying Mask « Sweetness & Radiance » rids the skin of impurities for a clear and bright complexion. The virtues of mineral clays and in particular of white clay are numerous. It is an ingredient of choice for a purifying care that respects the sensitivity of dry and delicate skin. 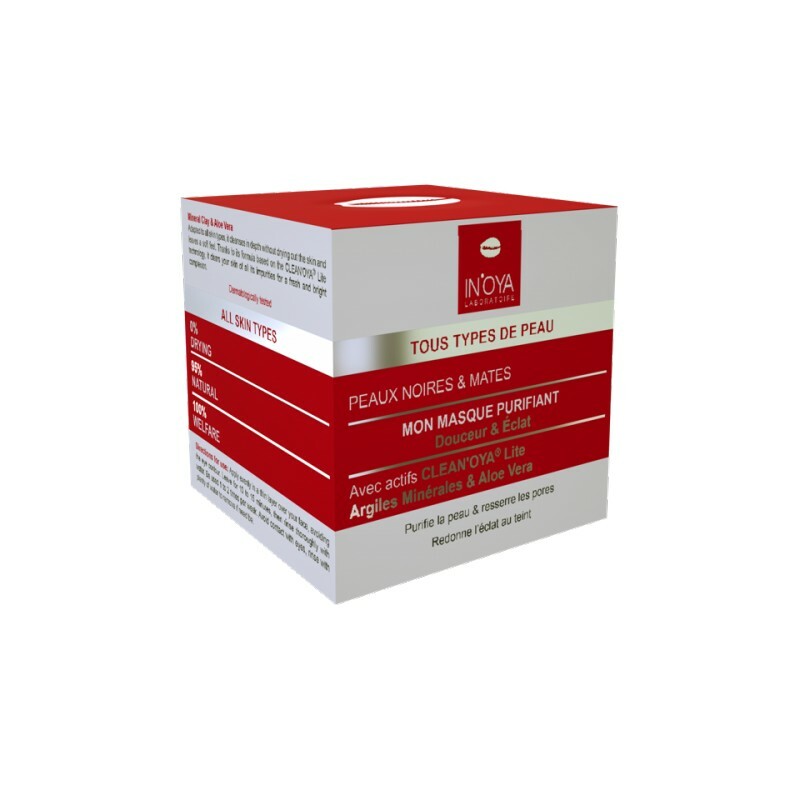 Their high absorbency makes it possible to regulate the excess of sebum and to matify the complexion for tightened pores and visibly sharper skin. 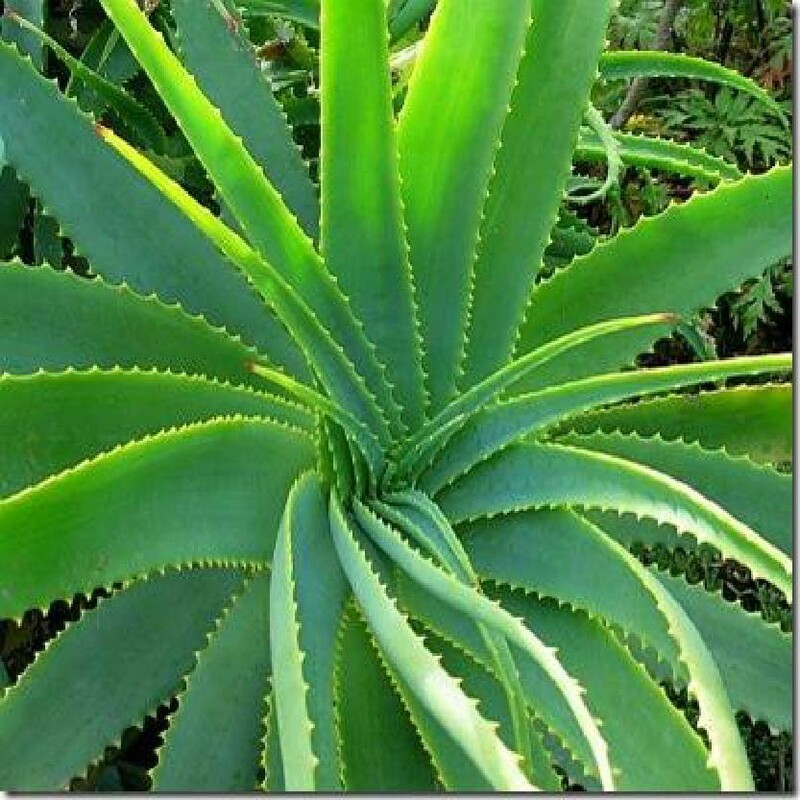 Aloe Vera, key asset of My Purifying Mask « Sweetness & Radiance », quenches the driest skin and provides comfort for sensitive skin. 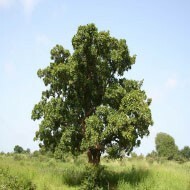 This action is reinforced by Shea Butter, from the Great Green Wall of Africa, due to its strong hydrating power. This active ingredient also promotes cellular regeneration to allow the skin to retain its elasticity. The new "CLEAN'OYA® Lite" technology formulated specifically for My Purifying & Brightening Purifying Mask is composed of unique active ingredients that provide the skin with deep cleansing for unclogged pores. The radiance of the complexion is revealed from the first use and the skin finds freshness and softness. Aqua (Water), Kaolin, Caprylic/Capric Triglyceride, Glycerin, Cetearyl Alcohol, Butylene Glycol, CI 77891 (Titanium Dioxide), Xylitylglucoside, Butyrospermum Parkii (Shea) Butter, Magnesium Aluminum Silicate, Squalane, Lactococcus Ferment Lysate, Aloe Barbadensis Leaf Juice Powder, Helianthus Annuus (Sunflower) Seed Oil, Enantia Chlorantha Bark Extract, Xylitol, Anhydroxylitol, Ethylhexylglycerin, Xanthan Gum, Glucose, Tocopherol, Tocopheryl Acetate, Oleanolic Acid, Ceteareth-20, Hydroxyethyl Acrylate/Sodium Acryloyldimethyl Taurate Copolymer, LacticAcid, Caprylyl Glycol, Chlorphenesin, Polysorbate60, Sodium Chloride, Citric Acid, Sodium Benzoate, Parfum (Fragrance), Sodium Hydroxide, Sodium Citrate, Sorbitan Isostearate. Apply My Purifying Mask « Softness & Radiance » in a thin and even layer over the entire face while avoiding the eye area. Leave on for 10 to 15 minutes, then rinse thoroughly with water. Use 1-2 times a week, morning or evening. Avoid contact with the eyes, if necessary rinse thoroughly with water. 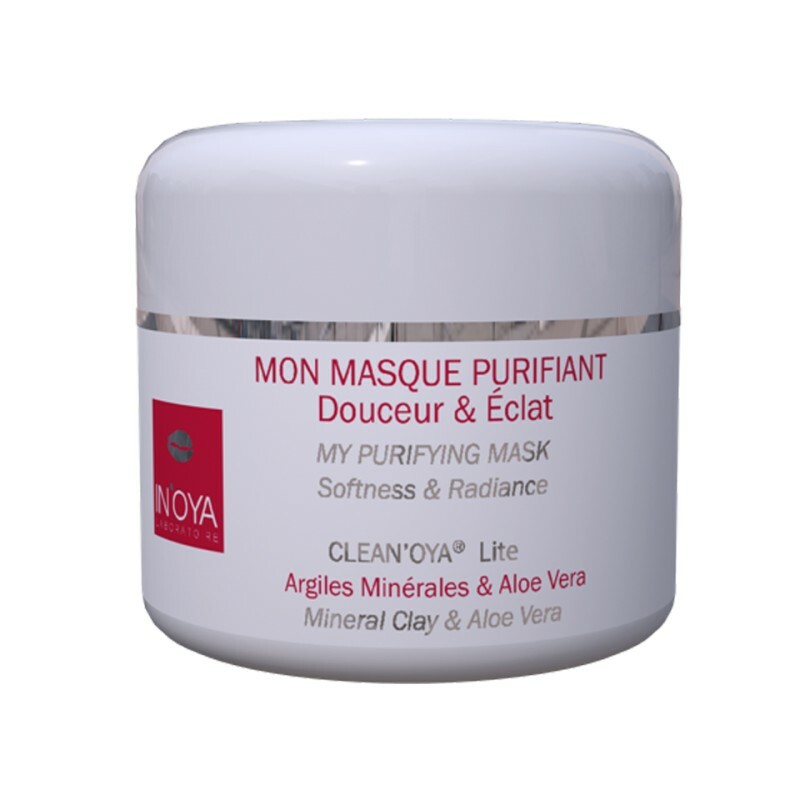 For best results, use My Purifying Mask « Softness & Radiance » after exfoliating your skin with CLEAN’OYA® EXTRA My Gel « Cleansing Exfoliating ». The combination of these two treatments provides optimal asset efficiency for visibly smoother, cleaner and brighter skin. For any personalized advice, you can contact your pharmacist or write to us by email at contact@inoya-laboratoire.com. Product reviews Write your review!